Although John Elway said during his Combine presser an extension for Chris Harris was not in the works, the Broncos are beginning to do homework on this situation. The Broncos met with Harris’ camp in Indianapolis, and the talks were “very productive,” Troy Renck of Denver7 reports (Twitter links). Harris said recently he would be open to a re-up, and Renck adds the perennial Pro Bowl cornerback wants to retire as a Bronco. Now 29, Harris would seemingly be in stronger negotiating position perhaps even than he was when he signed his team-friendly extension late in the 2014 season. Unlike at that time, the Broncos have no other surefire answers at cornerback. At the time of Harris’ previous extension, the Broncos were finishing their first year with what became a formidable cornerback trio. Denver’s 2014 acquisitions of Aqib Talib and Bradley Roby helped anchor the eventual Super Bowl champions’ defense, but the Harris-Talib-Roby era is ending. Shortly after free agency opens, it is likely Roby will be employed elsewhere, too. 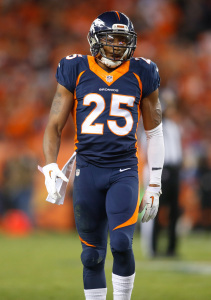 Also expected to let Tramaine Brock walk, the Broncos are searching for a No. 2 cornerback. Vic Fangio is expected to install more zone looks, following up several seasons of man-based schemes in Denver, but the new coach praised Harris as a key component of his upcoming defense. Harris is entering the final season of a five-year, $42.5MM deal. A Pro Bowler before that somewhat surprising contract was signed, Harris became one of this era’s top corners over the course of this deal, picking up three more Pro Bowl honors and an All-Pro cameo. Most recently, he graded as Pro Football Focus’ No. 3 overall corner in 2018. Given Denver’s immense need at this spot, and Harris’ performance on a below-market deal, it would make sense he will want a significant raise — perhaps at least in the Casey Hayward neighborhood ($11.4MM AAV). Denver is expected to pursue corners in free agency and the draft, per Renck. The Broncos hold $34.5MM in cap space. A Harris extension could inflate that figure, though the ninth-year corner’s has a manageable $8.8MM cap number in 2019.